1. Cultivate brand identity. Consumers have a lot of banking choices. Create and develop a point of ..
We recently undertook a number of global segmentations and found that generally speaking, millennial.. I recently went to the Geneva Motor Show. It was similar to the Geneva Motor Show of 10 or 15 years .. The rise of car sharing, especially amongst younger people, highlights the importance of affordable ..
Mobility solutions, ultimately, are about growing the reach of automotive companies. But it takes ti.. Many of the car companies are going through an internal cultural change as they face the need to nav..
Because of the shift in consumer mindset, they now expect the ability to preorder. But preordering p.. The fast food brands are responding to consumer social concerns other than health. Increasingly, the..
Business-to-business insurers are using data and analytics to drive better understanding of new and .. The insurance providers are harnessing new technology and analyzing big data to create more relevant..
As the Chipotle news story continues to unfold, it potentially becomes larger than the story of one ..
More small players are entering the market and intruding on the larger brands. In the insurance spac.. There is a sense of entitlement among luxury customers, a feeling that it is OK to reward yourself w.. Although people feel uncertainty, there’s increased confidence in celebrating luxury. A demons.. Younger people, especially, validate their style savvy by wearing the same fast fashion as everyone .. Luxury means vastly different things for millennials, compared to prior generations. It’s all .. The majors recognize that the international climate change agreements that we now have in place have..
Because the word oil has been demonized by some, we’re seeing majors rebrand as energy, techno.. Turning crude oil into refined lubricants and gasoline blends is a highly-competitive mixture of pet.. While fundamentals play a primary role in oil pricing, there also is an emotional component. Even wh.. It is said the best cure for low oil prices is low oil prices. But despite low oil prices, the ..
Just as the cultural conversation around femininity has broadened beyond obvious traits and tropes, ..
Purposed-based marketing creates a good speak in the marketing community, but evidence indicates tha.. Personal care is a wide category that spans from mundane to high fashion. Depending on which part of..
Outside of the US, we’re seeing the emergence of strong local competitors who are not affected..
For years, brands have relied on default loyalty. They rely on habit to keep their goods in the.. The world and families are changing in composition, roles, and gender identity. That means.. Personal Care brands adopting social missions to add legitimacy and differentiation to their point o.. The personal care category is less personal than it ought to be. The category is personalized from t.. The idea of the physical store design serving as a lasting monument is disappearing. The physical st..
One of the key questions for retailers is: What is twenty-first century service? Even for ret.. Brand experience and purchase are coming closer together. That’s what Amazon Dash does. I coul.. Retailers need to stop thinking of a retail environment as a place to maximize SKU count. By .. While brand leaders are often making significant investments in sustainability, they sometimes strug..
Health remains a prime consumer concern, but the nature of the concern is changing. In the past, the..
It’s ironic that when we work in other categories, businesses are scrambling to be perceived a..
Over 50 percent of technology decision makers are under age 40, which completely changes how you mar.. In the business-to-business part of the technology category, security remains the primary concern. I.. I would contend that the division of the technology category into business-to-consumer and business-.. There seems to be three levels of consumer privacy concerns. The first is annoyance over being hit w.. The business of many of the consumer technology companies is about making money from consumer data. ..
Privacy is a significant challenge for technology brands that potentially threatens business health ..
Few telecoms operators know what business they’re going to be in in five years’ time, so.. Established Telco brands were founded on engineering expertise. These brands still seek differentiat..
Telecom providers are trying to achieve a seamless one-stop shop which includes everything, both tel.. The telecom providers continue to struggle to develop emotional connections with consumers, particul.. The introduction of 5G will challenge the telecom brands to explain the benefits to consumers who wi..
Consumers want to blend the connectivity in the home, car and other aspects of life. That creates hu.. Some of the emerging Chinese brands enjoy greater market share abroad than they do in China. For exa..
Over the past 11 years, the BrandZ™ Top 100 Most Valuable Global Brands increased 133 percent ..
INTRODUCTION The brands that appear in this report are the most valuable in the world. They we..
Allan Hyde Senior Account Director Millward Brown Allan.Hyde@millwardbrown.com In our series of stu..
Fraser Hynes Research Director Millward Brown Corporate Fraser.Hynes@millwardbrown.com A larg..
Vital to transition from successful businesses to valuable brands by Christina Jenkins Direct.. Requires insight about millennials’ social values and work priorities Recruiting and re..
Prescriptive advice for hiring millennials 1. Be present online. Millennials spend a lot of time res.. But strong brands exhibit greater resistance It was a challenging year for the category performance..
Nihar Das Global P&G Business Leader MediaCom Nihar.Das@mediacom.com As global brands serve peop..
Will Goodhand Innovation Director TNS Will.Goodhand@tnsglobal.com New brands usually have a clear p..
Helen Rowe Head of Brand and Communications Research TNS UK Helen.Rowe@tnsglobal.com The str..
Emily Smith Brand Director Added Value E.Smith@added-value.com Many brands today develop a p..
Stuart Butler Chief Planning Officer Maxus Stuart.Butler@maxusglobal.com Purpose is important..
Brands and consumers resort to coping strategies Russian consumers are familiar with economic..
WPP brand experts gathered in New York during March for a session about the future of brands convene..
And revive the passion and purpose that originally made them great If the future of brands is .. But an influx of challengers slows progress Not long ago size mattered more. Because choosing the r..
Consumers of all ages are pushing out information every day. Passively via their newsfeed interactio.. The marketing world is obsessed with using traditional models of marketing cohorts to define the beh..
As banks attempt to rebuild reputation following the financial crisis, it’s not useful to view..
Building relationships and loyalty among millennials presents some special challenges. It sounds cou.. Direct banks such as Ally, Capital One 360, USAA, and Discover, have done a good job of growing thei..
A large number of banks have the desire to grow their investments business in the USA. In order to a.. Through Africa, we’re seeing an effort to engage customers with a massive amount of innovation..
Digital will be fundamental this year. Especially brands that don’t have a large marketing bud.. When people talk about a revolution in beer with the shift from a few premium light beers to a proli..
A lot of brands are still trying to find their way, particularly in premium where the messaging has ..
Brands in the energy and technology sectors are increasing their presence in a truly “glocaliz.. There had been a big gap in many categories between foreign brands and local brands, but the gap has.. The relaxation of the import tax on luxury is intended to drive more domestic consumption. It also h..
We will see more Indian brands with purpose-led communication. This means that brands will have to s.. Many brands are producing short films, perhaps three-to-ten minutes long, to distribute on social me.. Many of the plans that consumers heard from the new government after it took office two years ago ha..
Made in India - is becoming a buzz word. Leading multinationals, brands especially in personal care ..
Value is no longer a bad word in India. There was a time when value for money was seen as cheap, som.. The days are over when brands just entered the market and found consumers waiting to pick the.. Rural India will see the benefits of the government’s major investments during 2016. The middl..
One can say that the Russian people move from one crisis to another, and a crisis occurs every five ..
Russians are living in at least three or four decades at the same time. If you consider healthcare a.. It is important to invest in brand and corporate reputation now. Brazil has survived many crises and.. The middle class has learned a lot during this crisis period. They are treating it differently from .. The economic crisis is forcing consumers to rationalize their purchasing and it has affected how the.. The days are over when brands just entered the market and found consumers waiting to pick them up. T..
Pierre-Emmanuel Mahias Regional Planning Leader Mindshare Worldwide Pierre.Mahias@mindshareworld.com..
Roman Kostyuchenko Head of Strategy Young & Rubicam Roman.Kostyuchenko@yr.com One can say that..
Western brands too expensive for most Russian consumers by Pierre-Emmanuel Mahias Directo.. It holds great opportunity for brands that navigate it well by Aditya Kilpady Senior Vice President,.. Eager consumers line up for new store openings by Richard Mullins Director Acceleration R..
Asian brands grasp complicated dualities in culture and in O2O by Doreen Wang Global Head of BrandZ&..
Key actions will help multinationals dance to Latino beat by Leticia Arslanian, General Manager and .. The future belongs to those who prepare for it today by Mel Edwards CEO Wunderman EMEA Mel.Edwards@w..
Purpose-driven employees help activate the brand by Emily Smith Brand Director Added Val..
People still the make the difference in physical and digital store experience by Tim Greenha..
Consumer choice becomes wider and more complicated. by Stephen Drummond Chairman and Chief St.. In today’s world, a creepy line can kill a great brand by Lennart Håkansson Executive Vi..
Help shoppers browse, explore, find surprises and impulse buys By John Rand Senior Vice President, M..
Dads’ different attitudes and behaviors challenge marketing and media thinking by ..
Ease of use is key to brand Success with mobile apps by Peter Walshe, Global Brands Director ..
Brands need to think forward and plan for a connected reality by Jarrod Ramsey Vice Pres..
Talk about doing good and really meant what you say by Victoria Sakal Consultant Kantar Verme.. Car marketing illustrates the challenge in the era of customer control by Dan Whitmarsh ..
Find solutions in big data and the right digital channels by Patrick Xu CEO China GroupM..
Higher purpose produces devoted brand fans and financial reward by Iain Ellwood Wo.. The rapid shift in views of beauty and gender illustrate opportunity by Laura Tarbox Str.. Actions speak louder than core values by James Whatley Digital Director Ogilvy & Mather J..
Brands must marry vision, emotion to thrive in the new normal by Emilie Hamer Senior Vice Presi.. Disruptive forces challenge brands and old assumptions Millennial attitudes felt across most ..
All but three of the brands that appear in the 2016 BrandZ™ Brand Contribution Top 15 also app.. 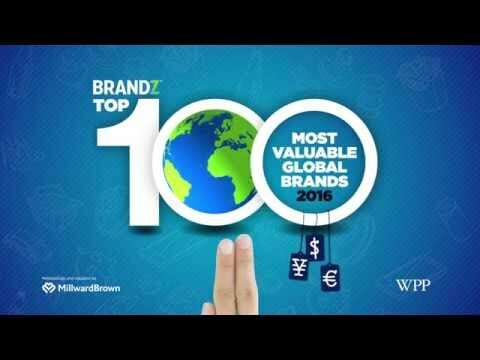 The seven brands that entered the BrandZ™ Top 100 Most Valuable Global Brands this year illust..
Category factors and brand strength drive change What a difference a year makes. More than hal.. But B2B brands demonstrate long-term stable growth Slower growth in China, Brazil and Russia, along .. Potential depends on purpose, responsibility, love and innovation When inevitable and often .. The ten most valuable North American brands increased 10 percent in value to $1.26 trillion, about 3..
Brands help consumers navigate challenging times Brazilian consumers faced reality, and it was ugly..
Local market-driven brands increase strength Despite slowing GDP growth and stock market fluc..
Consumers choose culturally relevant, purposeful brands Two years ago Indians were lifted on ..
Digital innovation influences manufacturing and marketing The BrandZ™ Apparel Top 10 in..
And brands peer into a foggy future of mobility Growth contradicted recent global patterns, with im.. But slower economic growth constrains spending Bright colored fabrics and the return of the logo en.. Global expansion continues despite slower economic growth Personal care brands contended with many ..
As the leading global brewers consolidate It finally happened... After years of rumors, the t..
Digital ordering shifts category to e-commerce The fast food category improved 11 percent in brand ..
As health concerns flatten carbonated drink sales It was more of the same – but different. C.. Initiatives aim to build reputation and reach millennials Global banks felt the impact of slo..
Oil industry loans erode results in North America The BrandZ™ Regional Banks Top 10 dec..
Digital start-ups challenge category niches Both business-to-business and business-to-consumer bra..
Brands continue pumping oil but pivot to gas A combination of global geo-political and economic fa.. In a year of product iteration and consumer privacy concerns Iteration, more than innovation,..
As the category moves through an identity crisis The term “telecom provider” started to..
10 Action points for building and sustaining valuable brands 1. Be purposeful. Every brand need..